All other links in the admin area seem to work. Can you please reupload the file includes/admin.inc.php? Maybe you forgot to upload it? I've tested the fresh installation and also the update from a minor version of the forum and especially I tested the settings page (main and enhanced) because of the related changes and everything worked. This and my own forum got updates to 2.4.19 and I can change settings here and there (with the exception of a white page during a test here, next attempt succeeded). I've absolutely no clue, what could have gone wrong. Also regular users are getting 500 errors sometimes clicking on bookmarks and sometimes selecting category. Can you please reupload the file includes/admin.inc.php? Ok, it was an attempt. You are sure, that this error did not occure before you updated your forum? PS: I got an empty page (but no HTTP-status 500), when I opened the posting form to write this answer. I've never seen a 500 error on MLF before and I guess this forum is on version 2.4.19 as since I updated to this version I too get 500 errors. Can you confirm there is no missing updated 2.4.19 files from the list that need uploading? This time I did not forget to mention a file. I can confirm this behavior in my forum. If I try to visit the settings, an error occurs. Web server of the project site buggy or is it the forum? I can't reproduce it nor retrace the problem. The webserver provides no logfiles for me and my Firefox browser acts bitchy every when and then since the update to version 65 (loaded pages stay white from time to time (no HTTP status 50x)) That happens with random web pages (including two or three occurences in the project forum) and also with local stored HTML files (on my machine). 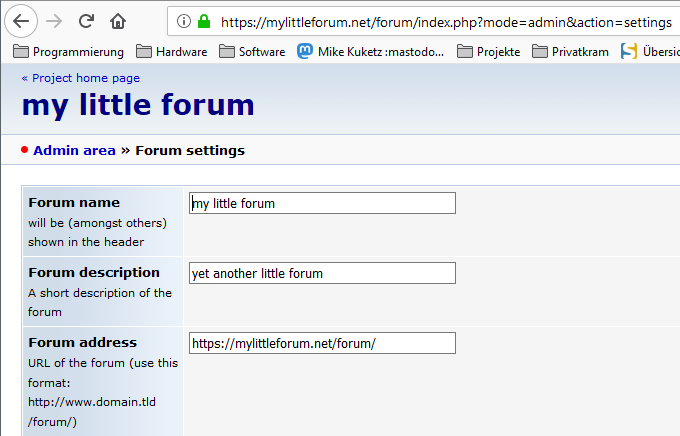 Thatswhy I currently can't distinguish between a browser problem, a bug in the forum software and one in the webserver. I will use another browser for the next days for testing purposes. Does anyone else sees any problems in any browser? I can confirm the 500er error. I got this error yesterday, during changing the SPAM properties (from 168 hours to 72 hours). Hmm, to bad having no logs. On my own server I get every few days simple-xml-errors during the search for a new version but nothing more. The lookup succeeds at the end but meanwhile the simple-xml-engine throws a bunch of errors because of invalid HTML-structures (not XML!). At that point I ask myself, if Github delivers from time to time error pages (HTML) when the script requests the Atom-feed. … And I ask myself if that could have anything to do with our problems … but I don't know. My friend who helps run the forum emailed me this, any good to you? The only thing, I can think of as cause of this error, is the following notice in the PHP-manual-page for mysqli_fetch_all: "Available only with mysqlnd." Not every installation of PHP seems to have an activeted native driver even it is the default MySQL-driver since PHP 5.4. I will rewrite the code to use the "classic" function mysqli_fetch_assoc instead mysqli_fetch_all. I hope to solve the issue that way because I found nothing else in the code that I would call suspect. This will not solve the problem(s) completely! I still get here an status 500 every when and then, not in the settings but on the main page. Have to dig further. Updated the posting to correct an error. Changed mysqli_fetch_assoc($connid, $rGetSettingsEdit) to the correct mysqli_fetch_assoc($rGetSettingsEdit). … on both places (settings section and advanced settings section). That should solve Juanma's issue with the undefined offset. Thank you for your reports and collaboration. I update the software. It seems to work fine! I updated meanwhile the project and my forum. Yesterday I stressed mine and the project forum with loading the main pages and the settings pages in four browsers every 20 seconds for more than three hours, to see if I encounter a blank page or a 500. I've seen nothing related but I might have missed occurrences. We will see. 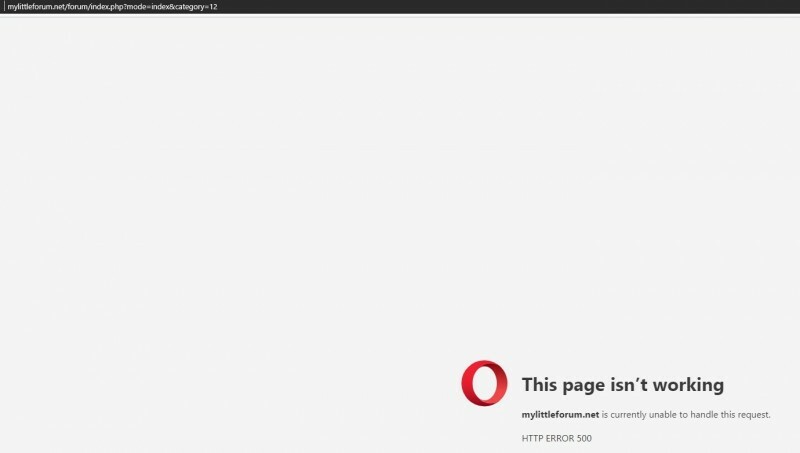 Since updating the code I have not seen any 500 error page on my own forum or on MLF. I gather I don't need to update to 2.4.19.1 if it is just for the things I updated manually? Like I say it has only happened a few times and I cannot pinpoint a sequence of why. Now that I have reported it maybe you can tell why? I don't know. We store the last visited uri of the forum at the session. If the login is finished, we redirect to the stored uri (taken from the user session). Due to the individual session of the user, I cannot reproduce your behaviour. If it happens again I will make sure to note what I did proceeding it.